Hello loves! 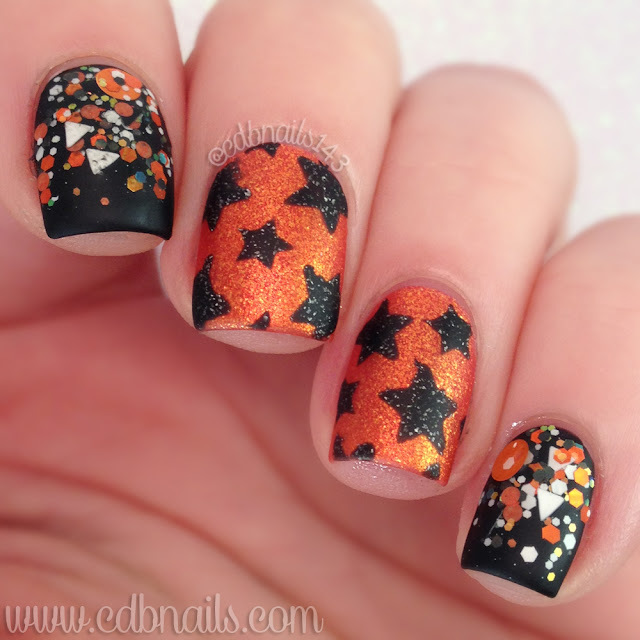 Today's Quick post is for Hobby Polish Bloggers monthly link up. This months prompt is simply Halloween. I decided to just go with the main Halloween colors, Orange and Black. 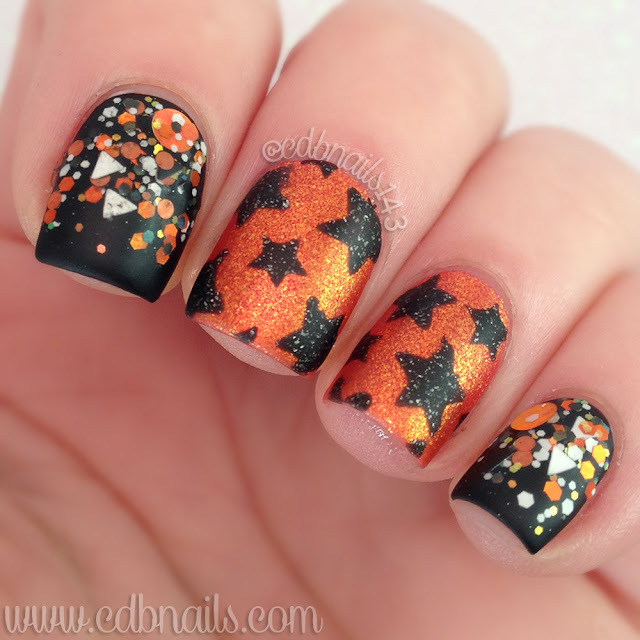 I feel like now that we are ending the month my creative juices to come up with Halloween manis are, well, non existent. The hubs actually had to help me come up with this because I legit just drew a blank. He thinks vinyls are cool, his exact words lmao! So he picked the star vinyls and he then pulled out the Different Dimensions Monster Mash Glitter and told me to theme my mani colors and design on that polish. Here is what I came up with. I actually really like how this turned out, Simple but fun! 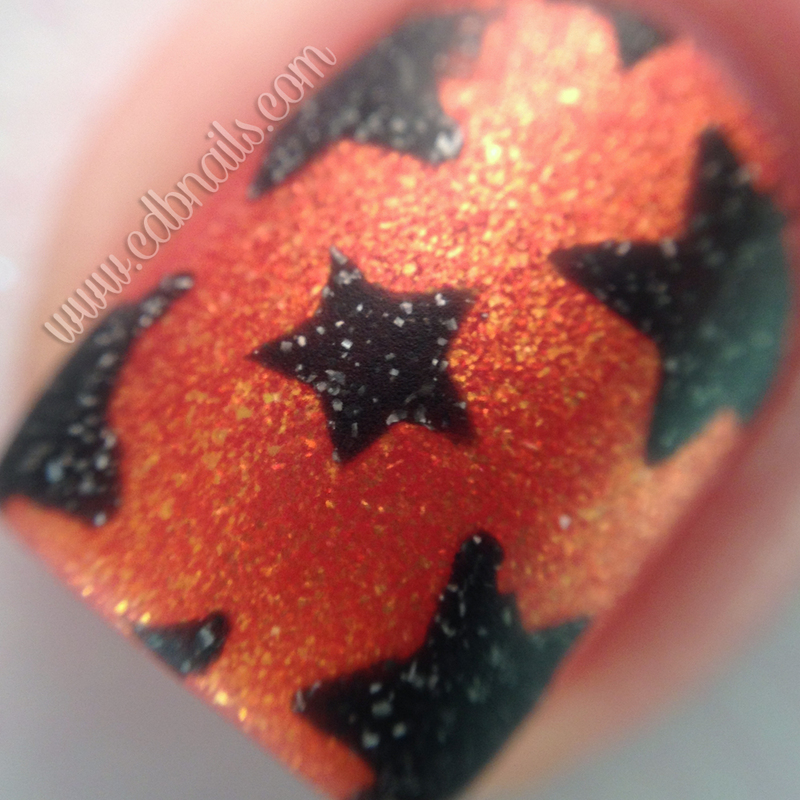 Zoya's Amy(Orange) matched the orange holo glitters in Monster Mash Perfectly and of course I had to use my most recent obsession Storm(Black Glitter) by Zoya as well. The polishes really do work so well together. This is so nice and well done! I adore the mani! The design, colors, and glitter look great! this is a wonderful idea. I really like how you mixed Zoya with the Indies. I have Wet n Wild's matte coat and haven't used it yet. I need to give it a try, I think. These turned out really great! Your hubby is awesome too! Lol.